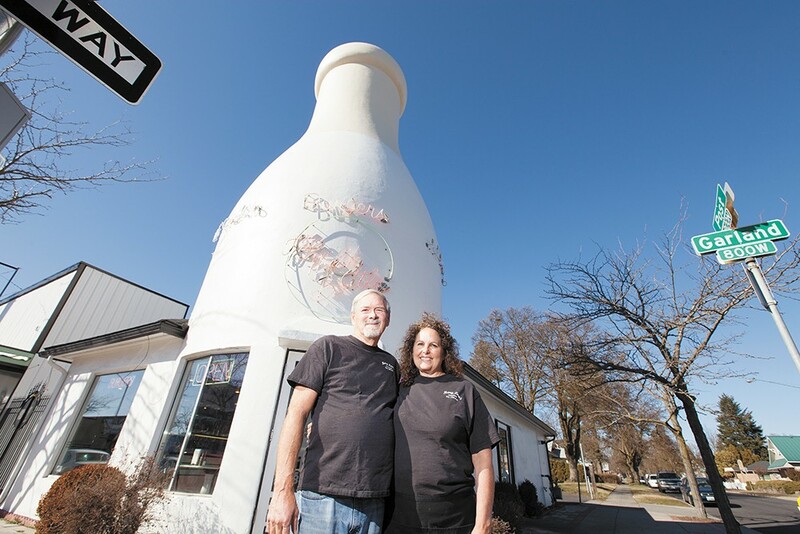 Owners of Mary Lou's Milk Bottle: husband and wife Edward and Kris Ritchie. Stepping into the dim light from the drizzling darkness, groups of bearded hipsters, grandparents and college students alike entered through The Elk's front door hoping for a space to sit. Instead, they were greeted with hardly a place to stand. Not entirely unusual for a Saturday night, but this was different: This early March evening was the Elk's 15-year anniversary party. Special beers were offered and an up-and-coming rock band played in the corner — people were willing to wait to take part in the celebration. Voted the Best Neighborhood Watering Hole in the 100% Local category, special to this year's readers poll, the Elk was one of the first businesses to take a chance on Browne's Addition near the turn of the century. "People thought the [owners] were crazy to want to build there," says General Manager Marshall Powell. From the infancy of Elkfest to the opening four years ago of El Que, the next-door taqueria, Powell has witnessed the past decade's changes firsthand. He attributes the Elk's longevity to consistency in menu and service. "We don't follow trends and we're not too pretentious," Powell says. "We treat our employees well, which is why we have little turnover, and they in turn treat our customers well." Browne's Addition isn't the only neighborhood to see a resurgence in recent years. The South Perry District, voted Best Walkable Neighborhood, has also become a shining example of what can happen if local business owners combine efforts to reinvent an area. With broad sidewalks, ample crosswalks and a low posted speed limit, South Perry is now a place people can roam freely, walking from one locally owned store, bar or restaurant to the next. As Inlander reader Aimee Bell commented, "It's just the kind of neighborhood that makes me want to leave my car at home." Up north in the also walkable Garland District stands a towering, famous milk bottle. The location, which has housed a variety of businesses over the decades, now is home to Mary Lou's Milk Bottle, voted Best Mom-And-Pop Business. Kris Ritchie, co-owner for 15 years, says she never thought of her shop quite in those terms. But as mostly family runs the enterprise — her husband Ed is co-owner, their children are cooks and servers, and a couple of grandchildren wash dishes — she sees how the business has a mom-and-pop feel. "We do have other employees too," Ritchie says with a laugh. Every day, Ritchie continues the ritual of creating the cookies, pie and ice cream, as well as balancing the diner's books. Her husband serves as store manager and bakes the hamburger buns. In 2011, the Milk Bottle was nearly destroyed as a fire ravaged the building. Ritchie says local support allowed the business to prevail. "I was so overwhelmed by how many people came to visit us," she says. It's all in the family for downtown's Atticus Coffee & Gifts shop as well, voted Best Single-Location Coffee Shop by Inlander readers. Married couple Andy and Kris Dinnison have been running the establishment for more than four years, alongside their other shop, Boo Radley's. With a homey feel and eclectic mix of retail and caffeinated beverages, Atticus Coffee has an avid following. As Andy explains, being fresh is an important aspect of their business, which equates to selling mostly local products. "When you have a place like Cake Bakery and more in town, why would we want to sell packaged baked goods?" Andy asks. "Or when you have a half-dozen roasters here, why would you buy beans from elsewhere?"